Liu Minghui is an eight-year-old boy. He lives in Ruijin, Jiangxi Province. 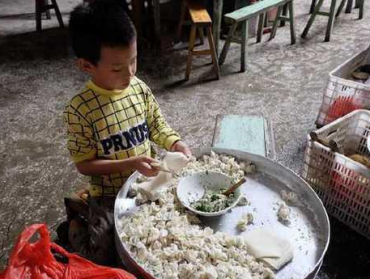 His story recently catches many people's attention because he makes about 10,000 wontons（馄饨） in a day. Liu's parents work in a different city. Liu and his 6-year-old sister live with their grandparents in the countryside. During the National Day holiday, Liu sells snacks and wontons with his grandparents. The boy can fold 10,000 wontons in a day. People say he is a good boy. In fact, he often helps his grandparents since he was three years old. Liu studies hard at school. Liu hopes to go to university in the future. Then he can make money to support his family. And he wants to buy beautiful clothes for his younger sister. 1. How old is Liu Minghui? 2. Liu Minghui can make ____ wontons in a day. 3. Liu is a _____ boy. 4. What’s the boy’s dream? A He hopes to be a teacher. B He hopes to be a rich man. C He hopes to travel around the world. D He hopes to go to university in the future. 5. Why does Liu want to make money? A Because he wants to be rich. B Because he wants to make money to buy a house. C Because he wants to make money to support his family. D Because he wants to buy beautiful clothes for his parents.